The right of passage target (before you were considered a contender) was 1 Million points, however quickly 2M was achieved and everyone frantically made refinements to their 'run' to hit the 2M mark. Suddenly 2M was standard and scores of 2.1M and 2.3M started to creep in, then for a while we were all stuck at 2.45M. Which brings us to my run. Richie! had headed back down to fraternise with the Portsmouthians and re-engage Cunzy11 in Silent Hill 2 sessions, I however had remained committed to the Tricky effort and continued to seek perfection. After a few weeks battering away, I finally had the (almost) perfect run and passed 2.45M and racked up a score of 2.6M!! 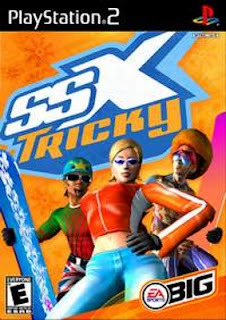 To say i was chuffed was an understatement and even though the general Tricky commitment elsewhere had waned it still felt great to know at that moment in time, in our collective of SSX gamers, I had the top score. I of course shared this news with the masses, taking a moment to enjoy it before easing in to a life without Tricky at the forefront of my mind. "I think I've messed up your memory file"
Words that will send a chill down the spine of even the hardest of gamers. However I instantly dismissed it, explaining he couldn't achieve that by accident, that he would have had to have gone in to the memory card, select the game, click delete and even then confirm the deletion. "I was drunk and came home wanting a race and I think I got trigger happy"
Again I dismissed it, however quickly started to fire up the PS2 nervously. Upon loading Tricky I immediately could see that characters were locked as were all the good boards. My face was suddenly stricken with panic as I frantically loaded up the high scores on Garibaldi. There it was, an empty leaderboard, a vacant space where greatness had once dwelled. There was no sign of my 2.6M, my blood, sweat, or tears, and no sign of the journey of scores that got me there. I was devastated, broken, and inconsolable. There is an epilogue to this tale of sadness, as the replay of my 2.6M run had made it unscathed by the drunken brutality. However as any of the Tricky fraternity will know, the replay does not contain the score and while the run is clearly a good one there is no proof of the 2.6M achievement. I never played Tricky again.